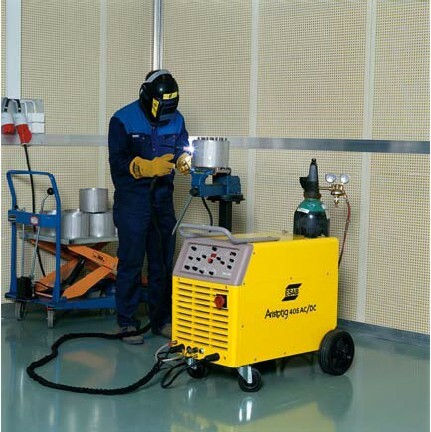 The base for Quality TIG welding is achieved by a powerful fast reacting inverter. The state of the art regulation supplies fast response and exact settings, resulting in superb performance. Automatic filling of new gas in the hose when you switch on the unit is one of the many ways we help the welder to improve welding quality. This unit has been optimized for manual TIG welding of all types of weldable materials and thicknesses. You can also weld with most coated electrodes up to 6 mm diameter. steels, alloyed steels, stainless steels, titanium, nickel and alloys, copper, brass and silicon bronze. The angled front protects all the settings and makes them easy to use and read. For ease of operation, lamps show set up information as well as which parameter is in use. Easy to use and linked settings simplifies the welders work. frequency setting, pulse parameters, etc. AC frequency control to get better control and penetration. • A soft-hot start function gives secure starts. Set in % of max current. • Spot welding facility. Every time you press the switch the unit will automatically make spot welds according to your preset slope up, weld time (0,1 up to 10 s), slope down, end current and post flow. • End current setting reduces risk for craters. • Presetting of currents with digital display. This unit is a robust well proven inverter based power package. Designed for IP23 which means it has been made also for tougher outdoor conditions. If some external input to the unit is falling eg water, mains or temperature the unit will automatically stop and the fault lamp will blink. 5 codes in a display window shows you what the fault was so it can be remedied before you restart. This unit with an ESAB torch can handle welding in heights up to 7 m from the unit. Quick connections makes it easy to connect the torch to the water connections. It is easy to fill up the built in watertank by using the lid on top of the unit. In surroundings, sensitive to HF, the lift arc function is the best way to start. The HF has been minimized to reduce risk of disturbance to surrounding equipment. This unit is energy efficient. So even at full power you only need a 25A fuse.